Aussie defender Alex Wilkinson saves the Socceroos with a goal-line clearance. Goal-line technology has been implemented in this World Cup, and the sensors did not go off. Replays showed that the ball never fully crossed the goal line, and hence no goal was awarded. Check out a preview of the game from before via the AP below. CUIABA, Brazil—With his trademark shadow-boxing routine at the corner flag, Australia forward Tim Cahill may provide one of the iconic goal celebrations at this World Cup. And if anyone is going to score in Brazil for the tournament’s lowest-ranked team, it’s most likely going to be Cahill. But therein lies the problem for the Socceroos, who are heading into a third straight World Cup with their chances having been written off before a ball has been kicked. A reliance for goals on a 34-year-old in the twilight of a career spent mostly playing as a midfielder exposes the dearth of forward options for coach Ange Postecoglou in Brazil. The only other out-and-out striker in the squad is 21-year-old Adam Taggart, who has just four international caps and is playing abroad for the first time. That lack of a cutting edge is the main reason why Australia has been given little hope in a Group B that contains heavyweights Spain and the Netherlands, as well as first-up opponent Chile on Friday. “We certainly believe we can be a threat in other areas,” Postecoglou said after a training session in the stifling humidity in western city Cuiaba on Thursday, when asked about Australia’s weakness up front, “but with Timmy, if he does get half a chance in the box, particularly in the air, he can hurt any opposition. And no one has scored more goals for the Socceroos than Cahill, whose total has risen to 32 after playing up front for the national team for the past four or five years. It is a role he sometimes reprised for Everton in his eight years in the English Premier League from 2004-12, with his prodigious spring and the timing of his runs into the penalty area his hallmarks. In his first full season with MLS side New York Red Bulls in the United States, Cahill was the team’s top scorer with 11 goals in 2013. Cahill will have experience behind him in captain Mile Jedinak, the holding midfielder for Premier League team Crystal Palace, and Mark Bresciano, playing in his third World Cup. But the majority of the team will be sprinkled with youth as Postecoglou bloods a new generation with next year’s Asian Cup at home and the 2018 World Cup in mind. 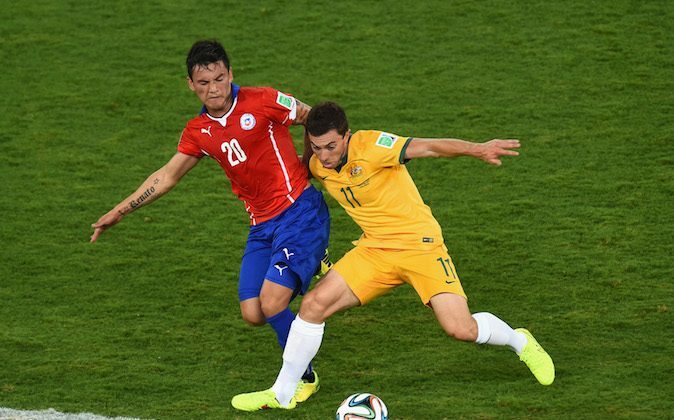 “People don’t pay attention to us, and that’s fine,” Postecoglou said. An estimated 15,000 Australians have flown to Brazil to cheer on the team, the country’s biggest following at a World Cup.